When I was a child, every Veterans Day meant that I would be attending the Veterans Day Parade. My grandmother would drive us to downtown Phoenix, early so that we could find just the perfect spot to view the parade. My grandfather would sit proudly in his wheelchair, wearing his VFW hat. My sister and I would sit on the curb or on Grandpa’s lap and watch as marching bands, colorful floats honoring the veterans, and groups representing various veterans organizations made their way along the parade route. Pray for veterans and their families, especially those who have died or are wounded. Pray for those on active duty defending our freedom. 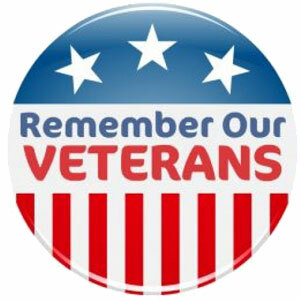 Make cards or write notes and deliver them to veterans hospitals or veterans groups in the community. Adopt a veteran in your neighborhood, especially if there is someone without family nearby. Invite your adopted family member to Thanksgiving dinner. Create an online memorial for a veteran–a family member or friend. There are many websites available that will host your memorial. Here are a few: forevermissed.com, remembered.com, Last-Memories.com. Display the American flag on Veterans Day. With your children read the rules for displaying a flag. Make sure that you follow the rules carefully to show proper respect. Donate to a veterans organization such as Wounded Warrior Project, Disabled American Veterans, or Veterans of Foreign Wars (VFW). Have all family members contribute by doing extra chores or doing without something. Play patriotic music or sing patriotic songs. Challenge your children to learn the words to our national anthem, “God Bless America,” or “America the Beautiful”–all the verses. Watch a movie that shows sacrifices made during wartime. Saving Private Ryan, Windtalkers are excellent movies, but their R rating makes them inappropriate for children. Warhorse, Pearl Harbor, U-571, Behind Enemy Lines, and Unbroken are all rated PG-13. Read the Gettysburg Address and discuss it’s meaning. Green light a vet. Change one of your outdoor lights to green in honor of veterans. The green light represents hope and well-being. I would love to hear how you celebrated Veterans Day. Please tell me by leaving a comment. My thanks to those of you reading this who have served our country. You will forever be in my heart. And to those who have family members on active duty, you are in my prayers.